Don't Miss Out... Be Sure to Follow Us on Twitter! Don&apos;t Miss Out... Be Sure to Follow Us on Twitter! Jerm here again folks! How is everyone doing on this gorgeous day! Hope you all are enjoying the nice cool Tampa Bay weather! Well its all the buzz these days, and everyone is talking about Twitter! And why, not as its an awesome way to communicate and let people know whats going on in your life, or just the world in general. If you haven&apos;t hear, we here at VisitTampaBay have our own Twitter account and think you should become a fan! Not just for the sake of doing it either, we do some pretty cool stuff on there so you gotta give us a look! At any point I could be on there giving you tips on the beaches, tweeting live from awesome events, or even giving away free stuff, like tickets for Tampa Florida attractions! 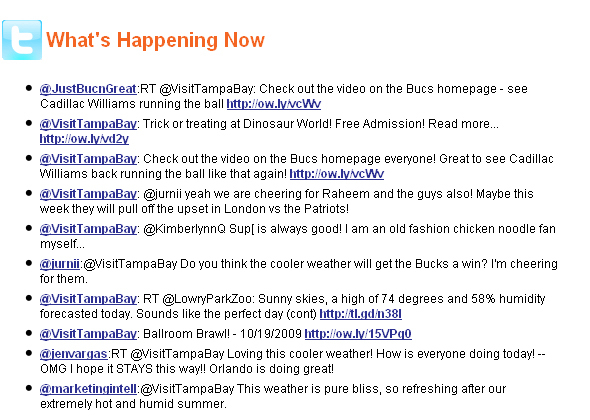 So be sure to log on to www.VisitTampaBay.com/Twitter and give us a gander! I will probably be doing some cool giveaways this week, so stay tuned for that and more updates from your Tampa Bay team of interactive Jerms!